The business world abounds with buzzwords. Among the latest and most widely adopted is ‘high performance’. The term is bandied about as much among business leaders as it is in the press. High performance coaches are no longer restricted to the sporting world and the name Elon Musk probably rings a bell with your dad. By definition, high performers hit targets. Whatever your organisational or individual, whether it’s sales, customer satisfaction, personal development, learning the tricks and tropes of high performance will speed up the process. However this continuous upwards trajectory comes with byproducts. Ever-increasing goals, coupled with an expectation of high performance and around the clock availability can lead to chronic stress, known as ‘burnout’. For organisations to thrive sustainably, we need to promote resilience of the body and mind, as well as vision, skills and communication. As such employee wellness and people centric leadership has never been so important. This guide draws the line between high performance and burnout. We’ve spoken to people who have led performance management initiatives for some of the country’s most ambitious and successful organisations, and have seen firsthand the devastating effects of burnout and toxic cultures. Drawing on this experience, we identify the ingredients that make up high performing teams, and learn strategies every leader can use to combat organisation-wide stress and burnout. On the surface, high performance might seem interchangeable with talent. While having a bunch of skilled people is of course useful for hitting targets, it’s only part of the solution. Natural aptitude doesn’t guarantee anyone’s ability to work with others, to share feedback, or any customer-facing skill at all. Talent alone isn’t enough. High quality practice, attitudes and culture underpin high performance. Duncan Campbell, founder and Managing Director of Business Behaviour, has worked on high performance training and consultancy projects for giants like BBC, HP, and BP (as well as brand names that aren’t acronyms, like Microsoft and Barclays). His approach to high performance strategy is developed from a time-tested performance management tool known as ‘balanced scorecard’. The approach separates high performance into four key areas: money, time, quality and people. “A good business should be measuring its profitability and how it uses money,” he says. “It should be measuring how it uses its time. It should be measuring the quality of what it produces, as well as the quality of its people and how they’re being developed. Duncan points out that, to strike the balance, organisations need “constructive conflict”. In other words, someone needs to be championing each corner during any important business decision. If one charismatic finance director convinces the board to cut budgets too ruthlessly, the people keeping the organisation ticking over will likely shoulder the burden and burn out – the equilibrium will be disrupted. In a high performance management scenario, our persuasive FD will come up against the cool logic and rationale of a director of people. Meanwhile the product director’s eye for quality will be paired with the COO’s dogged time efficiencies. It’s important to note that this system doesn’t take into account external forces. So let’s not be too harsh on the finance director in the wake of a 2008-style recession. People initiatives are usually introduced in one of two ways: either with one figurehead championing the idea and gaining the support of the wider organisation; or through a small and influential senior group who inform the rest of the organisation. Gone are the days when organisations would have people on the payroll without a clearly defined remit – no matter where they are in the hierarchy, the first a simplest way to get people on board is to show them the value of their contribution. HR and the relevant managers need to recruit people with records of high performance results and provide continuous training and support once they’re in. The business needs to be HR’s mastermind topic. You need to know the intricacies of the products it’s selling and the ones it’s trying to improve. You need to know what the competition are up to, and where the business is streamlining, and so on. Without getting bogged down in the day-to-day mechanics of each department, HR can use its bird’s eye view to provide clarity and help solve problems. This will likely involve performance management to some degree. A considered approach to feedback underpins all high performing people, teams and organisations. It’s a practice that’s easy to elude in our daily lives – giving and receiving feedback takes effort, and demands a degree of emotional intelligence. Partakers must neither be blunt nor shield the truth – a balancing act that comes naturally to few. HR is no stranger to broaching sensitive topics, and in doing so demonstrates value and trust. Empowering both managers and employees to put forward their best ideas and hone each other’s performance is a crucial first step to high performance. In essence, situational leadership means knowing when to be be directive and when to delegate, when to offer support and when to give people more freedom. Situational managers use coaching approaches to highlight autonomy and unlock creativity. Forward-looking HR teams have been scrapping the annual review process in favour of a more fluid and collaborative approach for a while now. When check-ins are few and far between, the opportunities for managers to shape employee behaviour and drive performance are limited. When feedback is continual and ‘in the moment’, manager-employee relations are strengthened and rapid development is facilitated. Such conversations should cover tasks at hand, as well as broader career development plans for the employee. Performance management needs to be minute by minute; not quarter by quarter. Last year, half of all employee absence was due to work-related stress, depression or anxiety. The Government’s recent Thriving at Work report, which set out to unearth the scale of the UK’s mental health problem, put the cost of lost productivity and performance through mental ill health at £42bn a year for employers. It also found that 300,000 Brits lose their jobs each year because of it. That’s roughly the population of Belfast. While these unprecedented numbers are invaluable in drawing our attention to the problem, they can feel abstract to us as individuals. It’s our collective responsibility – not just HR professionals, but all business leaders – to promote the wellbeing of our workforces and support those who are suffering. The success with which people can manage both personal and work-related stress largely determines business productivity and staff retention – and in turn, profitability and stability. 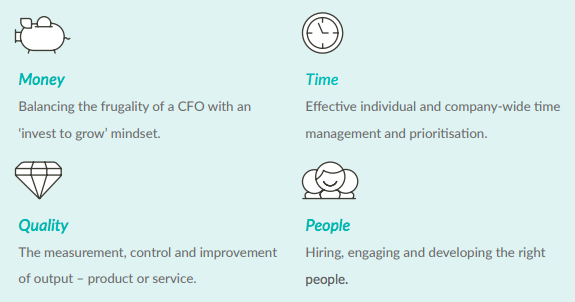 The HR department is uniquely positioned to equip every employee with the tools, education and support they need to manage stressors as they arise. This self-servicing is key to high performance. A moderate level of stress isn’t a mental illness. But specialists in the area know that, if left unmanaged, stress can be a precursor to more series mental health problems. While there’s no official medical definition of burnout, Psychology Today describes it as: “A state of chronic stress that leads to physical and mental exhaustion, cynicism and detachment, and feelings of ineffectiveness and lack of accomplishment.” To be clear, we’re not talking about the type of stress brought on by our weekly reporting tasks. The term was coined in the ‘70s, and commonly experienced among doctors and those in extremely busy, self-sacrificing roles. It has since entered popular business parlance and is experienced across the board of professionals and in many industries. As business targets grow, so too do the expectations on employees. Simply expecting more from already time-strapped people isn’t good enough. In order to deliver on ambitious targets, people need tools, education and support. They never turn projects down. They’re likely to prioritise work over personal engagements. This combination of self-sacrifice and ever-expanding workloads eventually takes a hold of the employee and grinds them to a holt. Difficulty concentrating – zoning in and out. A lack of energy – exhaustion, disrupted sleep or flu-like symptoms. Heightened irritability or unusual levels of left-criticism. A tendency to feel overwhelmed in busy or noisy places. One of the first tell tale signs – and the easiest to prevent – is overworking. HR and managers alike should have a heightened alertness to those who are consistently in the office when others aren’t – be it late into the night, or early in the morning. Our ‘always-on’ culture is fueled by multi-channel, multi-platform, multi-device technologies. A recent OnePoll study found 40% of us checks our emails between 6-20 times per day5, meanwhile Business Insider says a third of us check our phones during the middle of the night6. In order to consistently deliver to a high standard, we need to learn how to switch off. Anyone who’s trained for a marathon will know that rest is one of the three pillars of prep (right up there with running and nutrition). Duncan believes the key to tackling stress and burnout is to, "introduce high-quality resilience programmes, both internally and externally". He says these workshops should focus on four areas: body, mind, work and lifestyle, which have a cumulative effect when practiced together. Provisions for mental wellness at work need to be communicated top-down. HR and business leaders should promote a culture of openness and visibility around mental health, making it a pillar of your employee engagement strategy. Take direction from Mind’s three-pronged approach to managing mental health in the workplace. 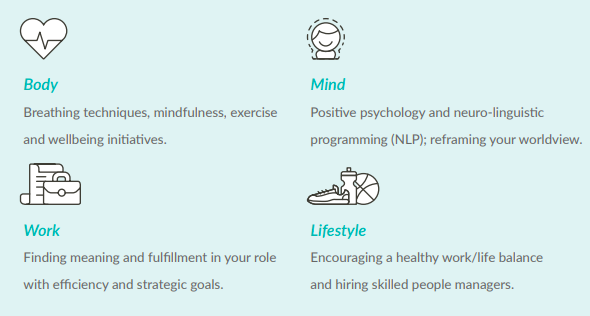 According to Thomsons Online Benefits’ UK Employee Benefits Watch 2016/17 report, companies that undertake a preventative approach to mental wellbeing see significantly higher levels of employee engagement and satisfaction. Leading by example, managers should support sensible working hours, encourage employees to take lunch breaks and annual leave, and to recuperate after busy periods. Benefits should focus on the financial and emotional, as well as the mental and physical, wellbeing of their employees. Regularly monitoring and assessing the mental health of your people might seem like an untenable, let alone excessive, precaution. But when you know what to look out for, anonymous company-wide employee surveys and line manager check-ins can give you an idea of the company and individual mood. Survey data can be used to establish wellbeing benefits and strategies, while one-to-one feedback allows managers to take positive action on an individual level. Mind estimates that one in six workers is dealing with a mental health problem, yet less than a quarter of managers have received any form of mental health training7. Organisations should have clear policies on workplace adjustments for those suffering anxiety, stress or depression. Any adjustments to the employee’s role should, of course, be discussed and agreed with them, but often the most effective changes are of attitude, expectation or communication on the line manager’s part. Company culture is hard to measure and harder to change, therefore many leaders choose to let it unravel organically. In doing so they miss the opportunity to shape what’s potentially their greatest differentiator and source of competitive advantage. While there are on paint-by-number frameworks to follow, all business leaders can nurture a culture of high performance. It’s about finding out what works best for your organisation. The following nine suggestions are tried and tested actions that facilitate short and long-term high performance. “When someone loves their job,” says Duncan, “work doesn’t feel like work.” In other words, anyone involved in recruitment needs to match positions to passions. This is often overlooked during the recruitment process which becomes a battle of qualifications on paper, rather than a zeal for the role. “Skills,” as Duncan points out, “can be learnt”. Every workplace is susceptible to disruption (in this instance, the traditional type), as explains Duncan. “During difficult times such as downsizing,” he says, “companies expect more from their employees with the ‘intention’ of hiring more people to shoulder the burden eventually. Many companies leave their employees doing more than they were originally hired to do which is unsustainable.” While flexibility is key to high performance, it’s imperative not to overburden your workforce with frequent new projects. If you don’t already have a culture guidelines book, now’s a good time to create one. Ask deep and search questions about what your brand values and the behaviours it expects from people. Take the opportunity to bake in traits of high performance – does your company culture actively encourage controlled risk-taking and creativity, for example? A large part of the high performance ethos is accepting there’s no one size that fits all. Clearly define what success looks like for each employee, team and department. This will of course differ fundamentally in terms of output, but you should also consider individual learning styles, skills and personality types to make any training most effective. This requires every leader to act as a coach. Coaches ask people probing questions – What do you think is the best way of doing this? How are we going to measure our success? What do you think the most important success measurements are? Recruit leaders with a history of high performance. Their CV doesn’t necessarily have to follow a steady and clear progression into the direction of your post – the common thread will be demonstrable goal-meeting, creativity and talent. High performers are typically keen to continuously develop regardless of seniority, so ensure you have a training programme in place. Physical environments have a profound impact on human behaviour and morale. While extravagant offices don’t guarantee creativity (Dyson hoovers, Hewlett-Packard computers and Instant Noodles were all invented in sheds), employers are realising that our external environments can mobilise teams, and facilitate learning and development. Recreation can, ironically, boost productivity, so it’s worth asking what your workforce would find useful, whether it’s napping pods or ping pong tables. Remember to drink your own champagne. That doesn’t need to be taken literally (that’s your call) – it means taking a step back and rewarding your people for what they’re doing. Acknowledging everyone’s extra efforts boosts morale and strengthens team relationships.